Fly with the Cuphead red cup in this fun game inspired by the famous Flappy Bird videogame. Test your reflexes by flying between the pipes implanted by the evil giant bird Wally Warbles to stop the threats of Cuphead. This fun game can be made from any device: Smartphone, tablet and PC. Dare and click this exciting game flying with the Cuphead red cup, dodge all the obstacles that cross the front to reach the final destination. 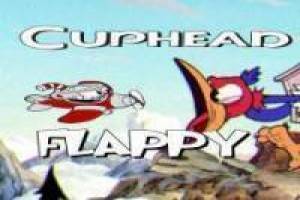 Enjoy the game Flappy Cuphead, it's free, it's one of our CupHead games we've selected.